Discover the power of Crystals – which Crystals help Migraine? A headache is stuck energy in your head. Find out how the gentle vibration of crystals can help get it moving and relieve your headache or migraine, here. Filed under: Uncategorized | Tagged: #BALIBLISS, Chakra Balancing Ubud, Headache Crystals, Jelila Healing Ubud, Migraine Crystals, Ubud |	Comments Off on Discover the power of Crystals – which Crystals help Migraine? Base Chakra Crystals. Which Crystals are good for Negativity? Grounding Crystals. Crystals can help to ground and release your negativity, pulling it away from you naturally, so you feel better. 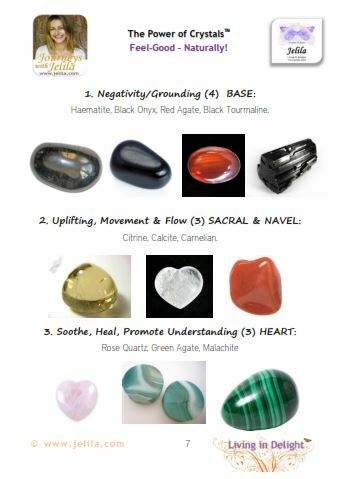 Crystals can help to balance your Base Chakra so you feel settled and safe. Filed under: Uncategorized | Tagged: #BALIBLISS, #healthyliving, Crystal Healing, Crystal Properties, Jelila Healing Ubud Bali, Ubud |	Comments Off on Base Chakra Crystals. Which Crystals are good for Negativity? Grounding Crystals. Want life to Make More Sense? As you discover how there are 4 key characters within you, and that Life is simply mirroring back to you each of these parts of yourself – you reach a greater self-understanding – and your relationships become easier too! What Crystals are Enlightening? What Crystals Activate your Third Eye Chakra? Activate Crown Chakra? Crystals that open your 3rd Eye, Activate your Crown Chakra and Upper Chakras are the more ethereal kinds of light Purple, Shimmery, Clear Quartz Crystals and Pearls. Filed under: Uncategorized | Tagged: #CRYSTALHEALING, #YOGABARNUBUD, Jelila, Jelila Healing Ubud Bali, Ubud |	Comments Off on What Crystals are Enlightening? What Crystals Activate your Third Eye Chakra? Activate Crown Chakra? What Crystals help Ghosts, Entities, Spooks and Derk Energies? How Can I release Negative Energy? How entities and other negativity be released, using Crystals? Filed under: Uncategorized | Tagged: #UBUDHEALING, Bali, Jelila, Jelila Healing Ubud, Ubud |	Comments Off on What Crystals help Ghosts, Entities, Spooks and Derk Energies? How Can I release Negative Energy?